5 U.S. GENOCIDE OF INDIAN PEOPLE R. Connie Uri, M.D., of Los Angeles, California declared that the United States Government has begun a plan of Indian genocide in America. As a panel participant at the National Convention of Law Students Civil Rights Research Council, Dr. Uri disagreed with other panel members who advocated abortion, sterilization and birth control. "Every Indian life is important," she said. She saw abortion, sterilization and birth control as a method of U.S. government genocide of American Indians. When asked to work for the Indian Health Services Hospitalts, Dr. Uri found that Tuesday and Thursdays were reserved for female surgery. i.e. abortions and sterilizations. All other surgery had long waiting lists becuase of scheduling. The Indian Health Services administers hospitals on all reservations. Dr. Uri called the U.S. control of the medical services available to Indian people. According to Dr. Uri, doctors in the Indian Services Hospitals receive 1/2 the salary of doctors in other U.S. financed programs, i.e. Veterans Hospitals. Statistics on National Indian medical needs include: infant death 24 times the national average; hepatitis: 15 times the national average; tuberculosis: 9 times the national average; influenza: 7 times the national average; rheumatic fever: 10 times the national average; suicide of adult Indians: 10 times the national average and teenage Indian male suicide: 50 times the national average. 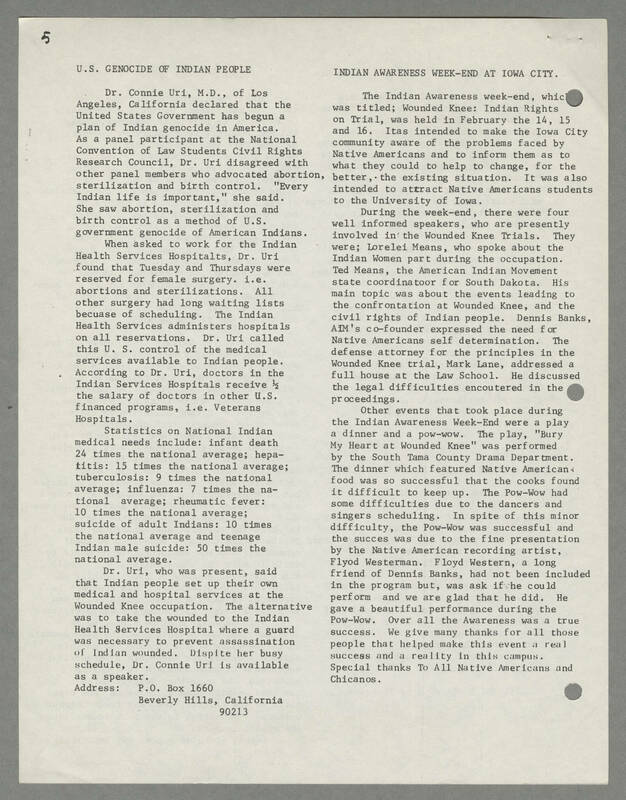 Dr. Uri, who was present, said that Indian people set up their own medical and hospital services at the Wounded Knee occupation. The alternative was to take the wounded to the Indian Health Services Hospital where a guard was necessary to prevent assassination of Indian wounded. Dispite her busy schedule, Dr. Connie Uri is available as a speaker. Address: P.O. Box 1660 Beverly Hills, California 90213 INDIAN AWARENESS WEEK-END AT IOWA CITY. The Indian Awareness week-end, which was titled; Wounded Knee: Indian Rights on Trial, was held in February the 14, 15 and 16. Itas intended to make the Iowa City community aware of the problems faced by Native Americans and to inform them as to what they could help to change, for the better, the existing situation. It was also intended to attract Native Americans students to the University of Iowa. During the week-end, there were four well informed speakers, who are presently involved in the Wounded Knee Trials. They were; Lorelei Means, who spoke about the Indian Women part during the occupation. Ted Means, the American Indian Movement state coordinator for South Dakota. His main topic was about the events leading to the confrontation at Wounded Knee, and the civil rights of Indian people. Dennis Banks, AIMS's co-founder expressed the need for Native Americans self determination. The defense attorney for the principles in the Wounded Knee trial, Mark Lane, addressed a full house at the Law School He discussed the legal difficulties encountered in the proceedings. Other events that took place during the Indian Awareness Week-End were a play a dinner and a pow-wow. The play, "Bury My Heart at Wounded Knee" was performed by the South Tama County Drama Department. The dinner which featured Native American food was so successful that the cooks found it difficult to keep up. The Pow-Wow had some difficulties due to the dancers and singers scheduling. In spite of this minor difficulty, the Pow-Wow was successful and the succes was due to the fine presentation by the Native American recording artist, Floyd Western, a long friend of Dennis Banks, had not been included in the program but, was ask if he could perform and we are glad that he did. He gave a beautiful performance during the Pow-Wow. Over all the Awareness was a true success. We give many thanks for all those people that helped make this event a real success and a reality in this campus. Special thanks To All Native Americans and Chicanos.